A visit to the local farmer's yielded many interesting greens, delicious greenhouse heirloom tomatoes, and Easter Egg radishes. I must say, it was wonderful to find so many farmers offering such high-quality, delicious items so early in the season. I really enjoyed talking to them and hearing about their pride and joy. The most interesting variety of greens I have ever seen is pea shoots. These are larger than "sprouts" but not yet mature enough to make peas. The funny thing is that they taste like peas! They are delicate and light and are delicious raw or cooked. If they were in the mass market they would be very popular. It takes about 2-4 weeks to produce them, while it takes all summer to grow peas. 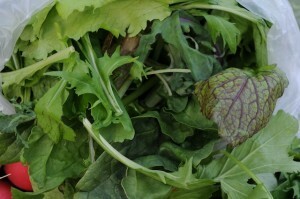 Mizuna - This green is similar to arugula but tastes less peppery. 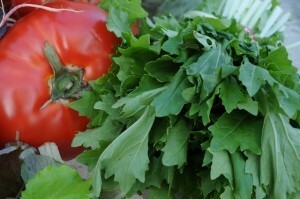 It is more like a mild cousin of arugula, and, like its cousin, it can be eaten raw or cooked. I plan to use it in salads all week long and will probably add it to a pasta dish or pizza too. 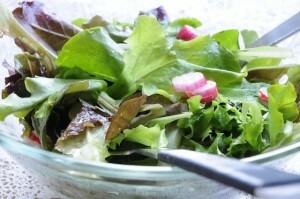 Baby spring lettuces make the most delicious fresh salads. 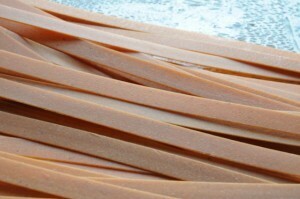 In fact, they make many of the grocery store staples seem so thick and tasteless by comparison. Braising greens are a colorful mix of a variety of thicker greens with an aromatic flavor. They can be sauteed or steamed, and the variety of flavors really mix well when cooked. The market was filled with baskets of these greens. 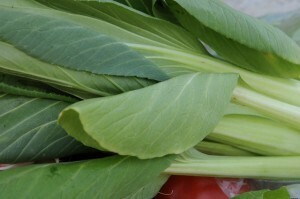 Bok Choy was so very fresh and tender - it almost looked plastic, it was so perfect. My favorite way to prepare this is "Asian-style" in a stir fry dish. 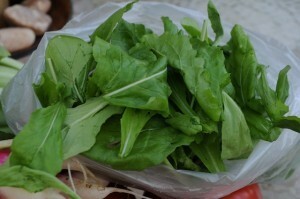 And Arugula, which is a peppery green that is great raw or cooked. This will go in salads and pasta dishes all week. 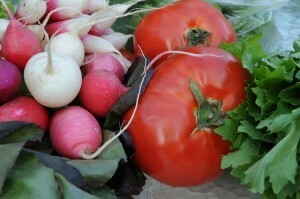 So, after photographing, I got to work in the kitchen to prepare dinner with my farmers' market finds. 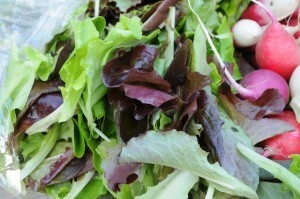 The spring mix of greens is very delicate, so I did not want to overpower them with a heavy dressing or vinegar. I elected to drizzle them with extra virgin olive oil, fresh lemon zest, and fresh lemon juice. 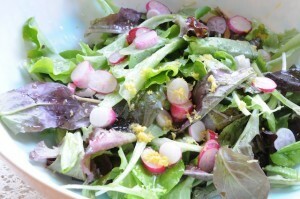 I also added finely shaved fresh radishes - very light and very delicious. These greens tasted like we grew them! I thought it was nice to serve them in a shallow glass bowl so the natural light enhanced their appearance. And here is the delicious entree that took 14 minutes to make! 1/2 pound orzo (we used lemon orzo from the market), cooked until tender. Then drain and rinse in a colander and set aside. 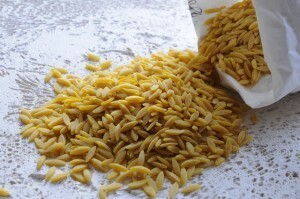 Cook the orzo until tender, about 10 minutes. Drain carefully - this one is large so it didn't go through the colander. If you have a smaller-shaped orzo you can line your colander with cheesecloth or a paper towel to help it stay inside and not go down the drain. Rinse lightly and reserve. When the orzo is cooked, heat the olive oil in a shallow pan and saute the pea shoots and tomatoes in a flash - just until the shoots wilt. This takes less than a minute! It is sort of like a warm salad with pasta. Very fresh! 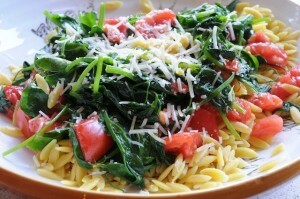 Toss the orzo with the shoots and tomatoes. Serve in a shallow pasta bowl with a squeeze of lemon and Parmesan cheese. Using greens is a great idea for a cooking demo because you can prepare them raw or cooked, and you can use them for the salad and the entree -- just as we have done here. It is always great to show people how to keep meals simple, healthy, and delicious. 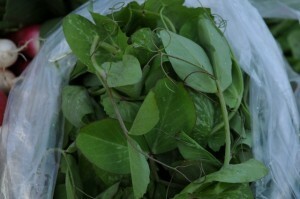 I hope you can find pea shoots - they are really a wonderful ingredient and I plan to use them often.